This is a custom ordered scroll. If you would like to order a custom handmade scroll in English we will do the translation and help you select cloth colors and accessories under many different budgets. 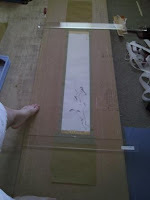 Contact sales@customjapanesecalligraphy.com to obtain more information. 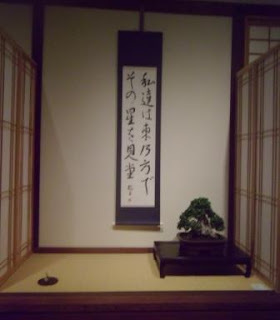 This scroll was done in the maru hyougu style and says, “Healing Comes from an Empty Hand and a Full Heart.” It is written in the full cursive style called Sousho. Characters styles were selected and written by Yoshimi Yamada Maples. 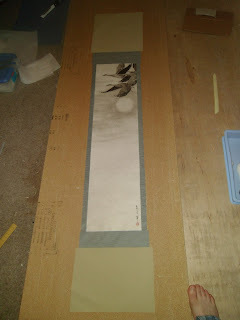 This scroll is going back East. The cloth selected was a Taupe. It is completed with a black lacquer jikusaki. Can you feel the cool Autumn Breeze with the moon in the distance? Perhaps viewing this display one could feel there are many technical points that are incorrect. Some part may be true if not looking at the entire symbolism in the display. For me, display is not to mimic what I have seen others do, but it is to feel and express my background and experiences in a veiled technique. For me this is the spirit of “Asobi no Kokoro”. The most glaring point that one may not be accustomed is the fact that this particular display does not depict a season or a singular point in time. It provides a panorama of the major events of the life of Jesus Christ with each display element. In conjunction, this runs counter to the Japanese traditions of Shintoism and Buddhism which heavily influence the art of display, and at times are actual elements used in the display. 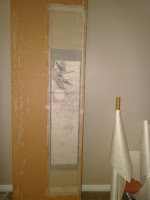 The first element of the display represents the birth of Jesus Christ and is the scroll. On it is written a Bible passage from Mathew chapter two in verse two in Semi-Cursive Japanese calligraphy. It reads, “Behold, we have seen His star in the East.” This scroll is framed in the informal style called Maru Hyougu, in a blue silk. The purpose of the color was specific and allows the viewer to imagine looking up into the night sky. This element in the display, based on size, compared to the size of the bonsai would be viewed by many as distracting or incorrect. The element proportions were however, chosen deliberately to embed a double layer of symbolism into the display. It will be discussed at the end of the explanation. The primary element is the bonsai. It is an olive in a Moyougi like styling. If viewing, one can almost see the Savior in the Garden of Gethsemane performing the atonement. I have read that Gethsemane means Olive Press, hence the selection of the olive. This trunk provides a visual cue of Jesus kneeling in prayer at the trunk of the tree. This bonsai is owned by a Southern California bonsai artist, and he and another bonsai artist styled and prepared the tree to be show ready, and to whom I express my gratitude at their graciousness. Mentioned previously, the tree is supposed to be the focal point of the display, and in the final synopsis this will be delineated as to why it is the focal point even though the bonsai is small. The accent is an empty tomb carved from sandstone, representing the resurrection. I also had figurines of Mary and Jesus commissioned, and which ones I will use in the final display I am yet unsure. I prefer the tomb, it is less direct and more in line with providing obtuse imagery. The figurines will perhaps be more direct in providing a visual story. To conclude, harmonizing the meaning of such a large scroll, with a small bonsai will now be expounded. It is true that I could have hand made a new scroll that was narrower, with smaller writing, and it would not have competed so strongly with the tree, but I have always really liked this particular writing of Yoshimi’s. 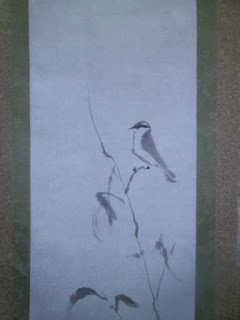 The brush strokes are not as thick as she normally writes, and is more feminine in nature. Additionally, as Christians in America, we tend to focus so much on Christmas and the birth of Jesus, that we forget the true mission was the gift of the Atonement, providing a path for repentance. It is the central event necessary to live in Heaven with God. Far too often though, the gift of repentance is secluded as an afterthought, when compared to the general celebration of Christ’s birth. For that reason, I hung this particular size scroll with this particular tree, hoping that all may recognize the importance of the item that should be central in the display. On the opposite side of this paper it is written in English. 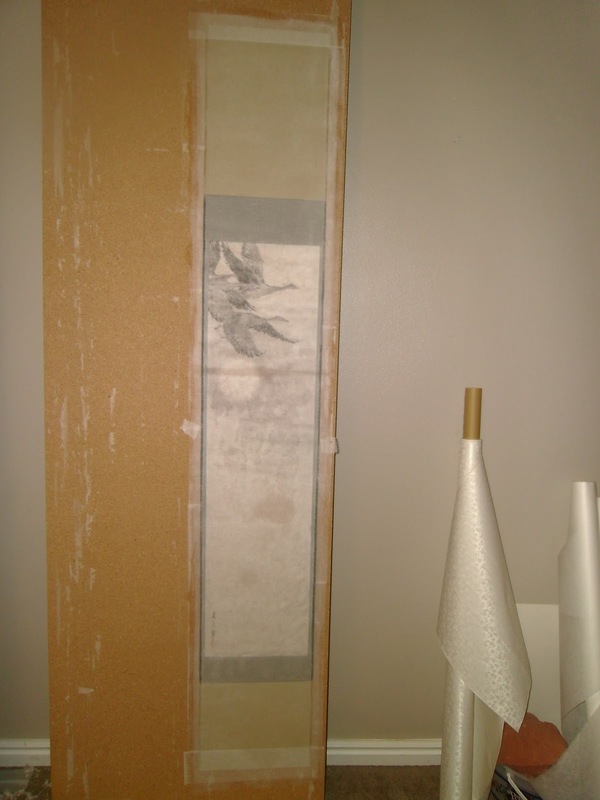 This scroll was commissioned to the South East for a martial artist. It is written in the kaisho (block print) style and has Bushido and then the seven virtues on the left hand side. The customer selected a very beautiful cloth that goes well with this writing. The Ichimonji is also a very beautiful kinran. Working on a Shrike scroll for American Bonsai Society 2013 convention.